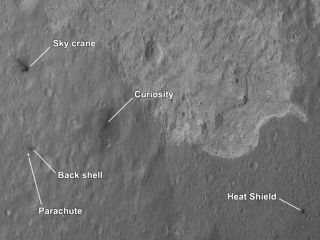 NASA's Curiosity rover and its landing sky crane, parachute and other hardware are seen by the Mars Reconnaissance Orbiter in this image released Aug. 7, 2012. Curiosity landed on Aug. 5 PDT. The first pictures of NASA's Curiosity rover on the surface of Mars have been taken from above by a spacecraft orbiting the Red Planet. The photos come from NASA's Mars Reconnaissance Orbiter (MRO), which snapped Curiosity as well as the Sky Crane landing stage, heat shield and parachute that helped deliver the rover to the Red Planet's surface. Curiosity touched down on Mars late Sunday (Aug. 5), beginning a two-year mission to study whether Mars was ever a habitable world. This image shows the crash site of the Mars rover Curiosity's sky crane, the rocket-powered backpack that lowered Curiosity down to the Martian surface on Aug. 5 PDT, 2012. Image released Aug. 7. "This is what we're calling a crime scene photo," Sarah Milkovich, an investigation scientist for MRO's HiRISE camera, said during a news briefing today (Aug. 7) at NASA's Jet Propulsion Laboratory in Pasadena, Calif. "We can see all of the components of the whole EDL [entry, descent and landing] system." Based on the picture, scientists can determine Curiosity's orientation, which matches up with the rover's own estimation of its direction. "You're getting the same information from orbit as you're getting from the ground, and that really makes you feel very good," Milkovich said. The parachute and backshell of NASA's Mars rover Curiosity are seen in this photo from the Mars Reconnaissance Orbiter released on Aug. 7, 2012. Curiosity landed on Mars on Aug. 5 PDT. The picture also offers further confirmation that the entry, descent and landing equipment worked largely as planned, depositing the various elements of the rover's descent stage in roughly the places predicted. The team also plans to adjust the pointing position of Curiosity's high-gain antenna to establish communications directly between the rover and Earth (so far, all communications have been related through MRO and the Mars Odyssey spacecraft, which is also orbiting Mars). "This is the start of our mission and there are a lot of folks on [the surface operations team] that have been practicing and training and executing for years," Watkins told SPACE.com. "It's great to actually put our rover through the motions here. It's also great to keep looking around the neighborhood. Every time we get a new [picture] we all crowd around the screen and watch the first images come up here." Visit SPACE.com for complete coverage of NASA's Mars rover mission. Follow Clara Moskowitz on Twitter @ClaraMoskowitz or SPACE.com @Spacedotcom. We're also on Facebook & Google+.